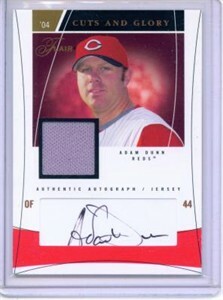 2004 Fleer Cuts and Glory certified autograph card of former Cincinnati Reds slugger Adam Dunn, with a swatch of his game-worn jersey. Numbered #95 of only 100 produced. ONLY ONE AVAILABLE FOR SALE.